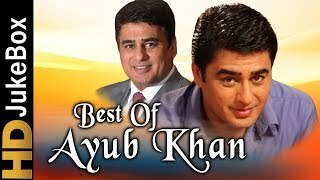 Ayub Khan (born 23 February 1965) is an Indian film and television actor, most known for the TV series, Uttaran (2008–2015). He is the son of actor Nasir Khan and Begum Para.He is the nephew of actor Dilip Kumar, his father being Dilip Kumar's younger brother. He became a household name after his portrayal of "Jogi Thakur" in the show Uttaran. He has acted in over 20 films since 1992 and in several television serials.